Summer in Germany means barbecuing by the river, relaxing in the garden and eating ice cream. But who works while we relax? Who repairs our bike, who takes care of our safety at the beach, and who flies us to far-off holiday countries? We show what summer feels like in Germany. Tube change, adjusting the brakes, selling: summer is peak season for the bicycle shop “Kettenreaktion” (Chain Reaction) – and for trainee Paula. Sometimes, she says, 30 to 40 customers come in at a time. She still enjoys the work. When his colleagues in the Leipzig Gewandhaus Orchestra go on summer break, the cellist Matthias Schreiber will be sitting in the orchestra pit of the Bayreuth Festival. Instead of a holiday, a Wagnerian treat. There’s nothing more pleasant than being outside in the sun and warmth. We have collected impressions of people enjoying the summer and sun! The Germans love hiking. And if the four-legged friends can’t keep up, it’s fine with him to come in a bag! Other dogs make even their masters run out of breath! The summer can be enjoyed right on your own doorstep. A hammock is perfect for this. Allotment gardens are booming in Germany. They are especially popular in big cities. To get a lot, some garden lovers have to wait several years. For some, even a small bed is enough to grow radishes, tomatoes and maybe a few herbs. There are places in every city that have established themselves as meeting places. In Munich one of these is the Königsplatz. The stairs in front of Glyptothek and Collection of Classical Antiquities invite many people to linger. German cities are proud of their numerous green spaces that serve as havens of relaxation. The English Garden in Munich, with its almost four square kilometers in area, is one of the largest inner-city parks in Germany. Germans love to barbecue. Despite the increasing number of vegetarians, meat retains the place of honor on the grill. Those who find locomotion in the countryside too drab take instead an excursion steamer. The new perspective makes familiar places look very different. Authors: Eva Frisch and Svetlana Kerestely, trainees at goethe.de/kultur. The Berlin juggler DJuggledy has been touring the world for more than fifteen years – and has become a big success. On the road, he says, it’s all about one thing: performance. 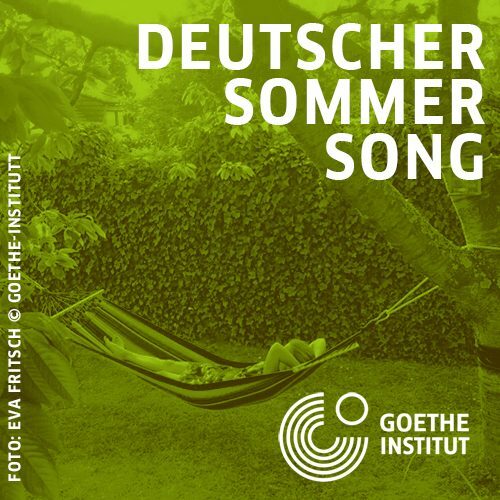 Together with you we collected our favourite German summer songs - the result is a great list of songs that make summer fun. Thank you for your suggestions and have fun listening! The love that makes Susann Stark spend her weekends in a tower on a Baltic Sea beach isn’t entirely innocent – not at least in the summer. As an aircraft captain, Peter Rix travels all over the world. That’s exactly what he likes about his job. In the warm season, he says, flying is especially nice. Not just for the passengers, but also for the crew. Rarely in Baden-Württemberg are so many ships on the water as at the summer festival “River Mood on the Neckar”. Year after year, Robert Schneider is at the helm. Goethe.de/kultur tells what the captain’s everyday life looks like and for which port he most likes to set sail. When the days are long and warm, there's nothing better than being outdoors after work or on weekends. In Germany, there are plenty of opportunities for this even in big cities. Our picture gallery tells how Germans combine their excursion in nature with a workout. The game enhances coordination, responsiveness and stamina. The German language distinguishes between the terms “Federball” and “badminton”. The goal of the latter is to beat the opponent as fast as possible. In contrast, Federball players usually see themselves as a team and like above all a good long rally. In the English Garten, a park in Munich, jugglers attract attention with flower sticks. The juggling device got this name from its ruffles, which are a bit reminiscent of a flower. Juggling requires a lot of patience and practice. Adventure, physical challenges and, above all, fear of heights await children and adults in the high ropes course. Climbing high, daring a Tarzan-jump, or walking on a rope are real tests of nerve. The climbing activities differ in the level of difficulty and everyone can choose the tasks according to his or her own strength. Familiar regions can be rediscovered by water. Some people want to relax while canoeing and let themselves drift along with the current for a few hours. Others paddle hard for two or three days, sleeping in a tent at a campsite. A short wait, then it’s your turn! How long you can enjoy the wave depends on you; if you fall into the water, the next in line is already riding the wave. Surfing on the Eisbach Wave in the English Garden in Munich is now also known abroad and is one of the attractions popular with tourists. There is no more accessible sport than running. Appropriate clothes and a pair of good shoes – that’s all you need. Various companies and city runs raise the motivation. We’re talking about not only the marathon or half marathon. The 5 or 10 kilometer runs are just as much fun. Strength exercises are more fun out of doors! Outdoor fitness uses tree trunks, walls or railings for training. Unlike tightrope walking, which has a long tradition in the circus, slacklining is a relatively new sport. It comes from the USA and was developed by climbers in the early 1980s as a training method. Since 2010, people have also been balancing themselves on a taut rope in German parks. Stand-up paddling (or SUP) was developed in Hawaii. In the 1950s surf instructors paddled there standing on a longboard in the waves and photographed surfing tourists. With the development of waterproof cameras, SUP lost its importance. It was only later, in 2000, that SUP established itself as a water sport in its own right. And if you don’t want to paddle yourself, enjoy the sight of others doing it! Find out what aktivities do Germans enjoy in summer and learn new words! Train terms related to cycling, listen to interviews and test your knowledge of cycling in Germany. In summer there are lots of fresh dishes and products on the table. Do you know their names?